In its early, freewheeling years during the 1920s, the National Football League (NFL) primarily located teams in small and medium-sized cities. Toledo, Akron, Providence, and Decatur all hosted NFL franchises during those years, with varying success. For one season, Hartford, too, played host to the NFL. It was a season racked with challenges. In 1924, sports promoter George Mulligan established the Waterbury Blues as an independent football team. After one season in the Brass City, they moved to Hartford. 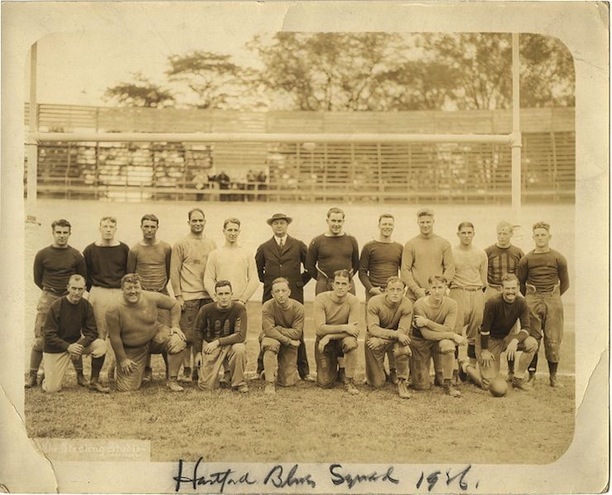 The NFL accepted just about any half-way organized football operation during this time as long as the owner paid the league’s entrance fee, and Mulligan signed Hartford up for the 1926 season. The Blues played their home games in the brand new Velodrome, a bicycle racing arena in East Hartford. After one exhibition game, the Blues made their official NFL debut on September 26, 1926, with many of the same players as the previous year. Playing before an estimated crowd of 6,500 at the Velodrome, the Blues lost to the New York Giants, 21-0. After three more losses, the Blues won for the first time, on October 24, by beating the Brooklyn Lions, 16-6. That game also took place in the Velodrome, though attendance slipped down to 1,000. After a fifth defeat, the Blues won their second game on November 7, again in the Velodrome, by a 16-7 score over the Canton Bulldogs. The attendance for that game reached 4,500. The Blues won for the third time, over the Dayton Triangles, on November 21, by a score of 21-0. That win raised Hartford’s record to 3-6 and proved to be their last victory of the season and, as it turned out, their NFL history. Heavy rain plagued the Blues on game days, keeping attendance down, and several times the rain became so severe in the Hartford area that officials cancelled the games. As the cold winter weather approached and with the team’s poor performance dragging down local interest (attendance slid below 1,000 for each of the last three home games), Mulligan cancelled several home games scheduled for December. Mulligan paid most players on a per-game basis and apparently decided to save money by simply cancelling games that did not figure to bring in enough revenue to cover costs. On the plus side, the Blues saved on travel expenses by playing only two road games. 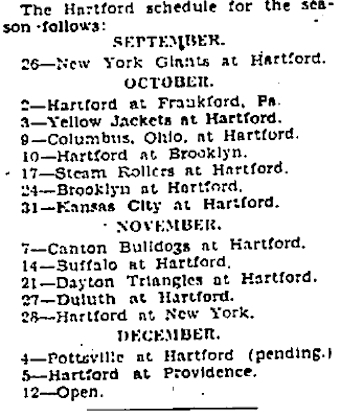 Hartford’s final NFL game was a 16-0 loss to the Duluth Eskimos in the Velodrome on November 27. The Blues finished the season 3-7. Though the season was hardly a success, Hartford fans who attended games had the opportunity to see some of the best football players in the world. Among the stars who played against the Blues in Hartford that year were two who played for the Blues in Waterbury: Harry Stuhldreher, one of the famed Four Horsemen of Notre Dame, who played for Brooklyn in 1926, and Steve Owen of the Giants, who earned enshrinement in the Pro Football Hall of Fame in 1966. Display advertisement for the Hartford Blues Football Season Tickets, Hartford Courant, September 25, 1926. Other greats who played against the Blues at the Velodrome were Ernie Nevers and Johnny “Blood” McNally of Duluth, Guy Chamberlin of the Frankford Yellow Jackets, and Pete Henry of Canton. The one and only Jim Thorpe was also on the Canton roster that year but unable to play in the game in Hartford because of injury. Like Owen, all became members of the Hall of Fame. Also of note was the appearance in Hartford of one of the five African Americans in the NFL in 1926, Sol Butler of Canton. In 1927 the NFL looked to reduce the number of teams in the league and voted to drop Hartford from its ranks. Mulligan subsequently renamed the team the “Hartford Giants” and they posted a 7-1 record as an independent team in 1927 before disbanding. and all of the team’s administrative offices remained in Manhattan. So nearly a century after their moment in the sun, the Hartford Blues remain the only NFL franchise ever truly to call Connecticut home. “Hartford Blues to Play before 10,000 Youngsters Sunday. ‘Kids’of City to Be Guests of Bill Savitt, Jeweler, on His Anniversary.” Hartford Courant. September 16, 1926. “Mulligan Buys Two Players for Hartford Blues.” Hartford Courant. July 14, 1926. “National Football League Will Act on Hartford Franchise Saturday.” Hartford Courant. July 8, 1926. “New York Giants’ Well Balanced Eleven Uses Aerial Attack to Trim Blues.” Hartford Courant. September 27, 1926. “‘Shrimp Foley’ and McCormick First of Blue Eleven to Report.” Hartford Courant. September 11, 1926.